The Commercial Bank of Ceylon opened a branch in Wariyapola, in the Kurunegala district, expanding its islandwide presence to 202 service points. It is computer-linked to other service points of the Bank islandwide, enabling online real-time banking. The ATM machine at the branch is linked to the 440 other ATMs of Commercial Bank in Sri Lanka and over one million terminals of the Cirrus (Mastercard network) and Visa networks worldwide. 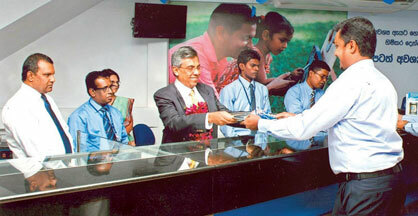 Here Managing Director of Commercial Bank, Amitha Gooneratne accepts the first deposit. Regional Manager Wayamba Region, Athula Samarasinghe, (extreme left) and Manager, Wariyapola Branch of Commercial Bank Wasantha Perera, (2nd from left) are also in the picture.